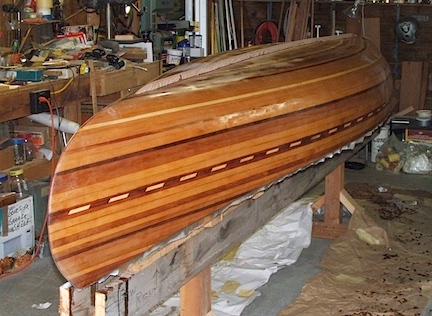 The first step in the fiberglas and epoxy work is to lay up a layer of fiberglass and epoxy over the stems. 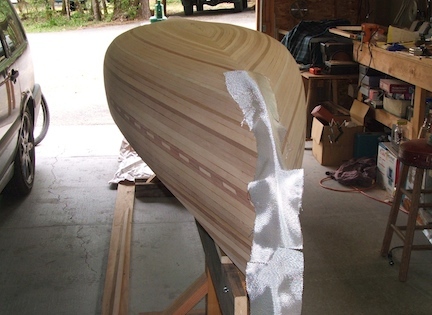 This, along with a double layer on the inside, will provide added strength to the hull. Here are some of the materials I'll use for the fiberglass work. My epoxy of choise is System Three "Silver Tip". This is mixed at two parts resin to one part hardener. I've been working at about 60° F so the pot life is about 30 minutes. After the epoxy is applied it takes about 45 minutes before it gels on the surface. I have sanded between coats but the System Three can be re-applied within 72 hours without sanding. 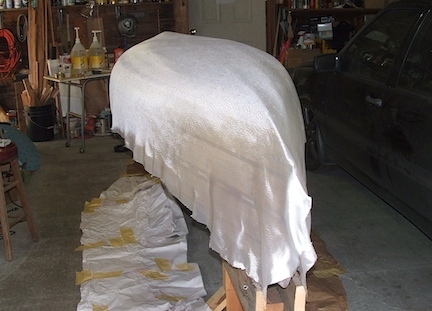 Here the fiberglass cloth is draped over the canoe and ready the application of the epoxy. The 6 oz. cloth will be cut two inches beyond the stems and an inch below the sheerline. I'll mix 9 0z. of epoxy (6 oz. resin and 3 oz. hardener) and spread it from the center toward the ends and down the sides, using a 3" foam brush and a plastic squeegee. 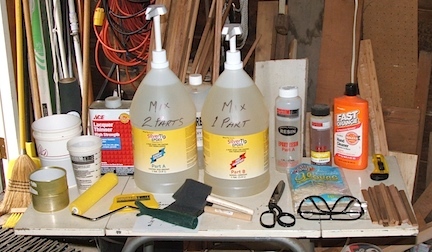 The first coating of epoxy was applied with foam brushes and a squeege, then brushed over with a dry brush to remove any runs. After the epoxy had set I attached the keel with thichened epoxy glue. The keel was held in place with the wood sticks to the ceiling as shown in the picture on my Sanding page. The fiberglass is wrapped around the stems is laid down with epoxy. This and the glass along the keel needed to be sanded before the second coating. 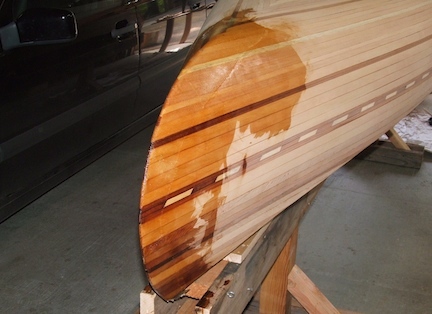 As it turned out, I sanded the whole canoe, then brushed on the epoxy with a bristle brush, squeegee, and dry brush. Here the third coating of epoxy has been applied. This one was done with a foam roller which applies the epoxy a little thicker. There were some runs showing up but I was able to brush most of those out with a bristle brush before the epoxy cured. 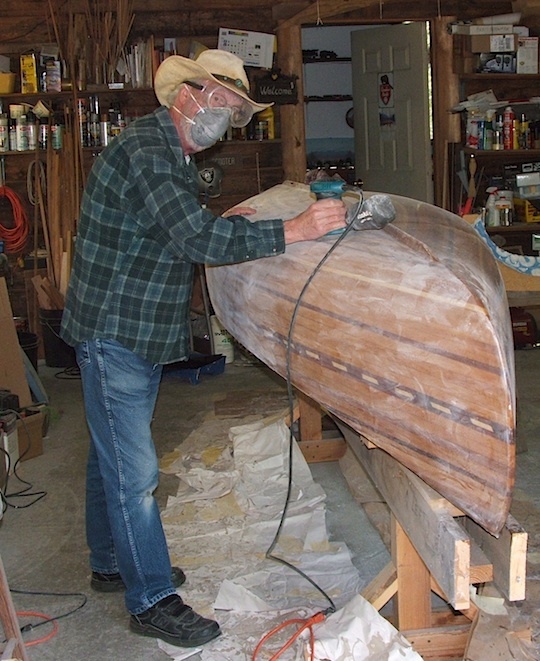 A final sanding before the canoe is taken off the molds. This time I'm using #220 grit sandpaper. Gone is the beautiful shine. 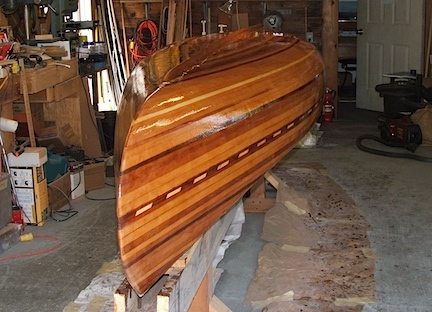 This sanding is in preparation for the varnish that will come after the inside is completed.